David Hurd's new collection of inspired choral compositions with organ accompaniment. 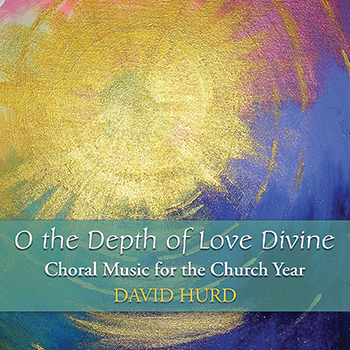 David Hurd, renowned organist and composer, shines in a beautifully ethereal collection, O the Depth of Love Divine. These pieces express the best of the Anglican choral tradition, fashioned in Hurd's compelling compositional expertise and his vibrant harmonic language. It is perfect for any established choir seeking to expand their repertoire. These settings vary from medium to difficult and are arranged for either choir with organ accompaniment or a cappella. "Rise Up, Shepherd," an African-American spiritual, combines well-known lyrics with complex chord structures and pleasing dissonance. The song showcases Hurd's unique style — impressive choral arranging with haunting organ textures. As mentioned previously, not all of these anthems incorporate organ accompaniment. With half of the compositions written for a cappella choir, this collection is a great choice for skilled choirs that love beautiful and challenging choral music. Hurd uses classic texts from the choral tradition that will find a place in various liturgical moments throughout the church year. His ability to infuse these texts with inspired compositional technique is remarkable. These choral works are sure to both intrigue and excite your skilled choir.